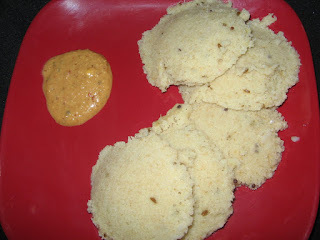 Oats -now a days majority of people are preferring intake of oats .I have seen this recipe in a magazine and prepared this,oats idli, hmm and it turned into a tasty variety. Mix powdered oats,with upma ravva and curds well.Also add a little water if needed,and keep it aside for 15 min. Just before preparing idlis add ENO fruit salt,to it and mix well.As soon as the fruit salt is added the batter will puff itself with bubbles.Immediately pour the batter in idli stand and keep it on stove and switch on.As soon as the idlis are cooked switch off the stove and serve them hot with chutney. I prepared seasoning with jeera and mustard seeds and added to the batter for a variation. to the batter just for variation. Very healthy and tasty idly. Oats Idly healthy option for all age.